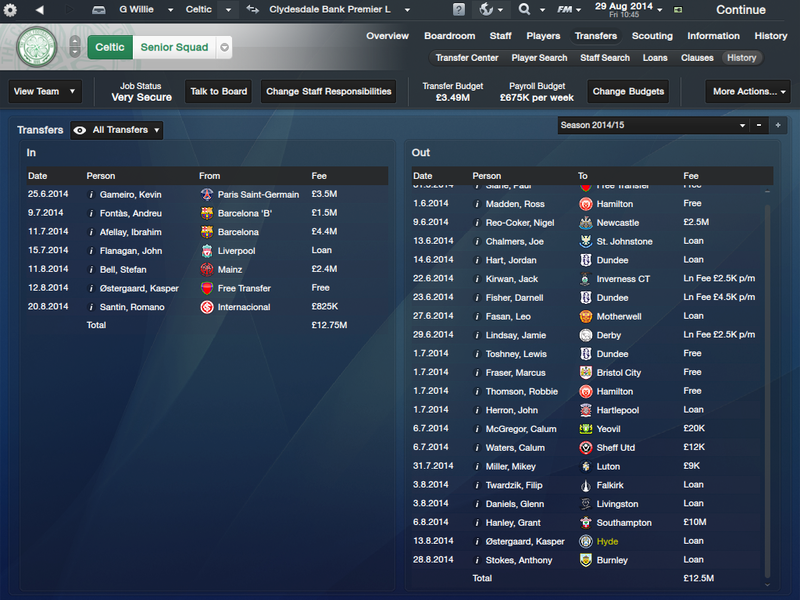 Wow, so Tony Watt is now out for 3 months in my save and other than Hooper I really have no other reliable striker. I am coming up in the January transfer window and they gave me 8.75m extra funds but I spent 5m of that on Grant Hanley from Blackburn to shore up my defense. Does anyone know of a great poacher that is cheap? How do you guys play Scott Brown and Joe Ledley? Both of them are supposed to be good BWM according to the scouts but they haven't really been doing well for me. Ledley has been brilliant as a box to box player for me in a 4-4-2 with a ball winning midfielder beside him. Chipping in with goals too. 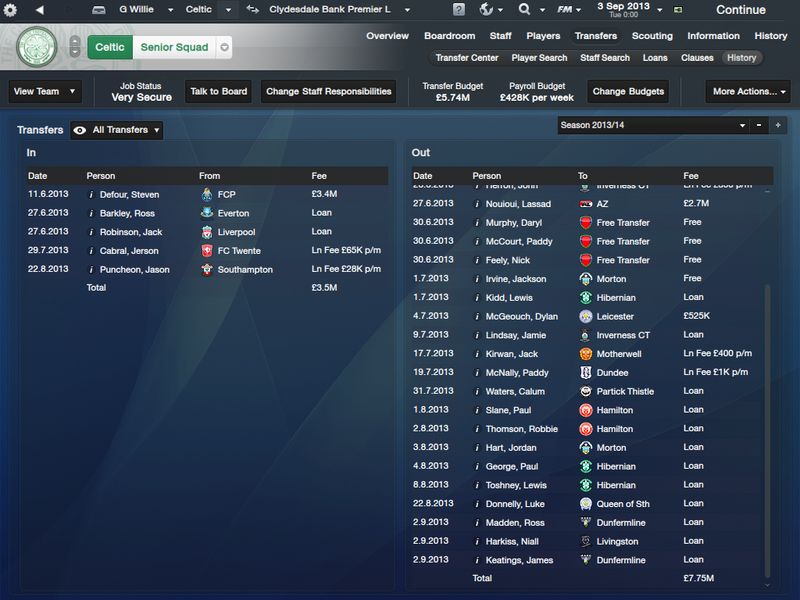 Just finished the January transfer window, brought in Hanley as before mentioned for 5m. 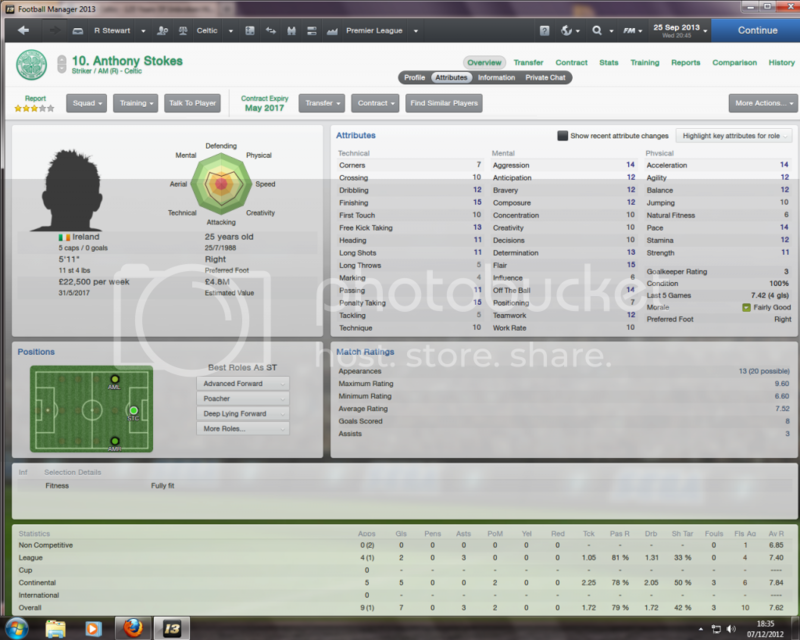 Also brought in an Icelandic AML on loan from AZ Alkmaar and Samed Yesil from Liverpool on loan. 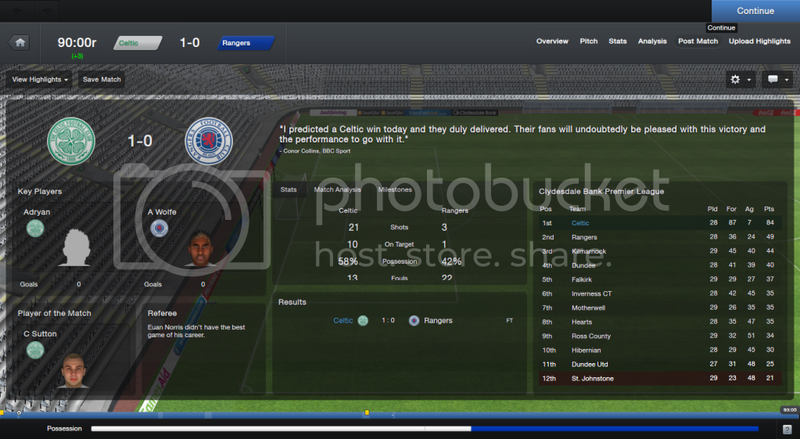 Whilst a more emphatic scoreline would have been maybe more befitting of the occasion I really couldn't care less as long as we took the three points in this match that would confirm me having managed Celtic to 10 in a row for the first time ever on FM. Even if the score in the game that clinched the title was a little underwhelming the team's overall performance in the league on the way to the tenth has been nothing short of sensational. Couldn't be happier with the way this save is going for now and with having drawn Spartak Moscow in the CL last 16 and having previously managed to get to the semi final, the CL trophy would be the icing on the cake of a (so far) almost perfect season. Only one team has defeated us this season, Arsenal beat us home and away in the CL group stages. Just noticed do you really have a player called C. Sutton in your squad, or have you renamed one that? It's just as well I live on my own, I must confess I went a little bit mental when the final whistle blew in that game...well a lot mental if I'm being really honest. He really is called C Sutton, unfortunately his first name is Callum. Still finding it hard to not retrain him to striker mind you as he's already a top centre back. 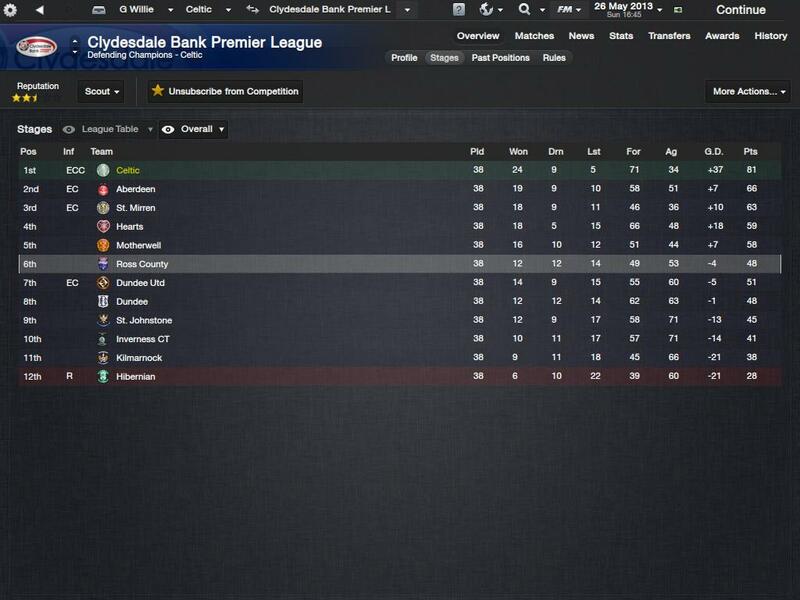 In my first season I won the league although Aberdeen was a pretty tough side as they were in first for almost the entire first half of the season. Gary Hooper, Victor Wanyama and James Forrest were easily our best players this season and Grant Hanley and Adryan were definitely the best signings of the season. We lost the Scottish League Cup final to Hearts 2-0 but made up for it in beating Dundee United in the Scottish Cup final 3-1. 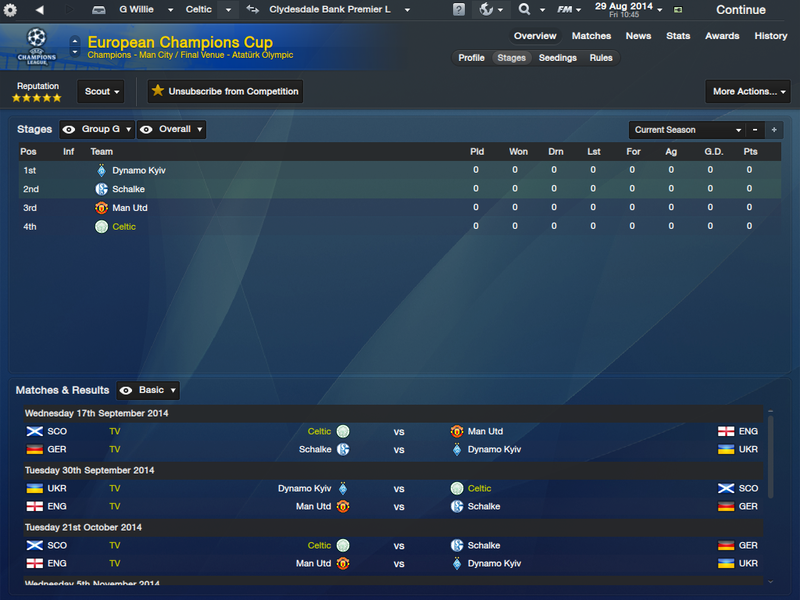 As for our Champions League group stage against Shakhtar, Juventus and Arsenal we finished in 4th unfortunately. Our highlight of the campaign was beating Arsenal 3-2 at home and fighting for third til the final day in which a defeat at Shakhtar made us finish 4th. Alot of players leaving the club on loan this season but mainly youngsters. Also got rid of Kris Commons, Beram Kayal and Lassad Nouioiu for some good income and bought a transfer listed Steven Defour from FC Porto for a cut price of 3.4m which I believe to be a great bargain. He was my only permanent signing this season as I failed to get a work permit on a great Argentinian regen winger for 3m which is such a shame as he looked to be potentially world class. 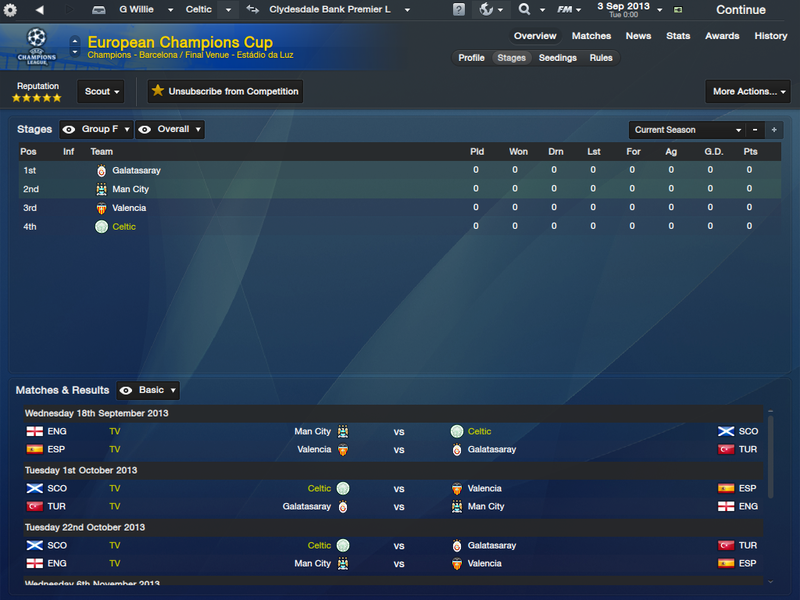 Once again a tough Champions League group as we are still seeded 4th. Hopefully we can pip Galatasaray to 3rd. I will take Valencia and Galatasaray over Juventus and Shakhtar anyday! What formation are you guys using ? I am tired of the 4-1-2-3 just seems like most of the time there is not enough upfront. Would prefer a formation with at least 2 out and out strikers. 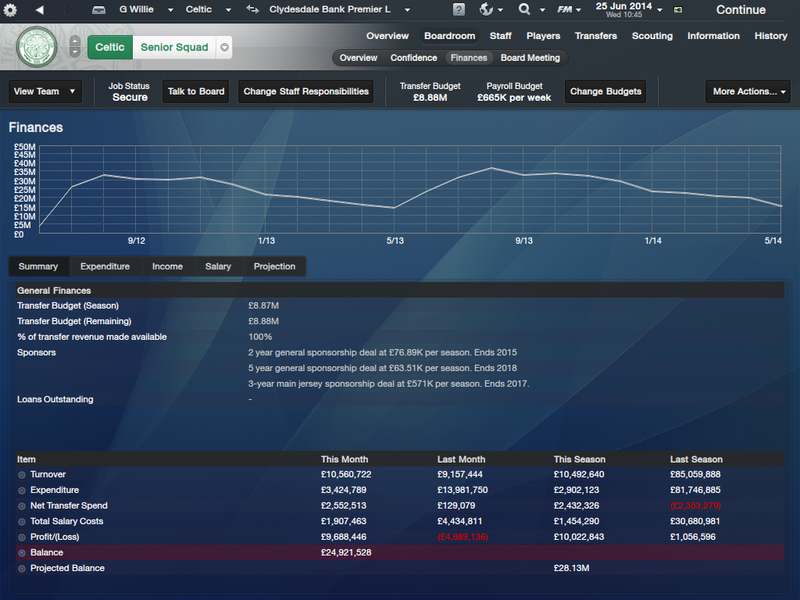 Into my second season and have £21m to spend! I use a 4-2-3-1 as I usually do. I usually use Hooper or Watt up front as a poacher but I am thinking in the summer I will need to find a proven goal scorer as they aren't scoring as many as I'd like. I also have James Forrest playing AMR as an Advanced playmaker and he is a beast and either Samaras on the left as an inside forward or a loanee as a winger. Then I have Adryan as an attacking midfielder and behind him I have a rotating midfield of Scott Brown, Nigel Reo-Coker, Joe Ledley and Steven Defour as BWM and DLP. Going back to my wingers I have two Argentinians set to join the squad when they turn 18 one already has joined and is my new AMR while the other will be AML. 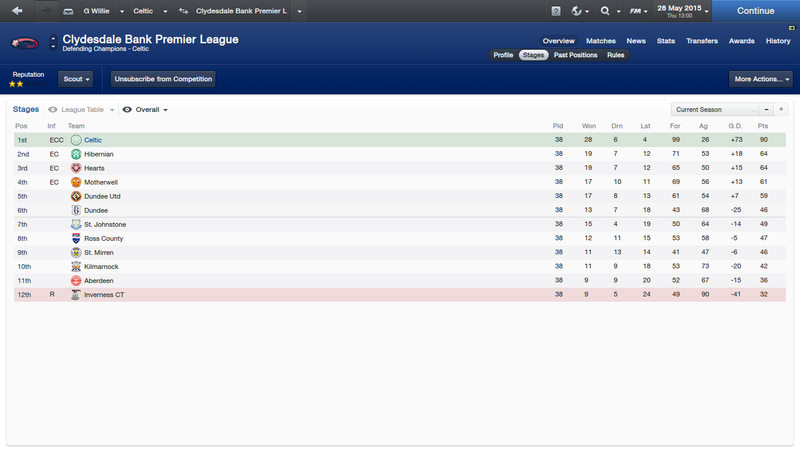 Easily won the league again this season. 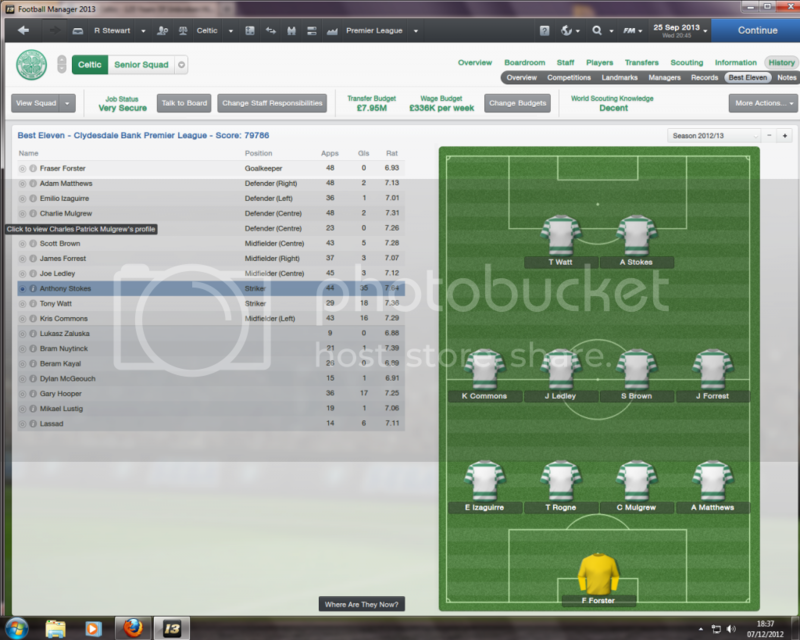 My best players had to be Wanyama, Hanley, Barkley on loan again and Scott Brown. 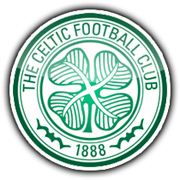 I think going into next season I will have to find a quality striker as Tony Watt is still young and developing and Gary Hooper really underperformed this season unfortunately. 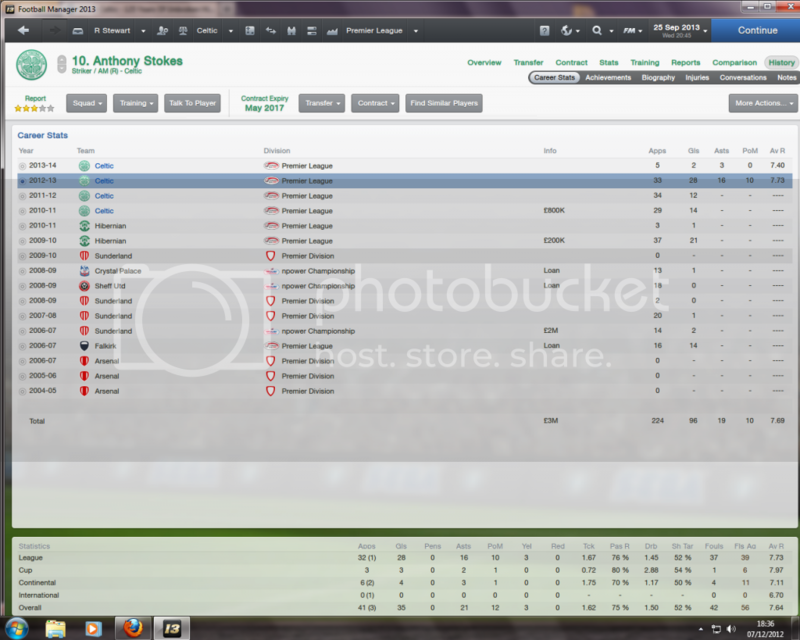 I will also have to find a RB and a back up AMC unless I can somehow get Ross Barkley back for a third season on loan. Bigger strides this season as we finished third in our Champions League group and even defeated Manchester City who is dominating the Premier League! We lost a heartbreaking tie against Lyon in the Europa League thanks to a Vincent Wanyama own goal but I have a good feeling next year we can make more of a stride in Europe which is what I ultimately want and was hoping for in this save. We also won the Scottish Cup 3-0 against Livingston but we didn't do so well in the Scottish League Cup which once again kept us from celebrating a treble. Anyone else having money issues at celtic? First season coming to Jan I had 38mil balance and board gave me 10m to spend so I spend all I could then I lost the rest of the money by the summer (I dont have many buy over 48 months players I paid most cash upfront). It got to the point by summer I was nearly going bankrupt so I sold like 15 players and I am now gonna have to blood a serious amount of youth. Loosing 3+ mil a month is not fun. Also anyone find buying good regens or young youth players they always want 11+ k a week even tho they wont get anywhere near first team for ages?? Poddy, its normal to make a healthy loss month by month. Most of the income arrives in the summer with season ticket sales, prize money and so on. You have to balance what you make in the summer months with what you lose in throughout the rest of the season. Try and keep monthly repayments to a minimum if possible. Look out for players trying to sneak in extortionate appearance and goal bonuses into their contracts. These things are not accounted for in your wage budgets. If you are losing three million+ a month then that does sound a bit hefty. I usually lose between 1 and 2 million a month dependant on champions league participation etc. A screenshot of your expenditure would be helpful. Money will in at different times between the end of one season and the start of the next. A screen shot of the expenditure screen should show the expenses for last season so should be a good indicator of where the money is going. One of the main problems I think I might have with Celtic is the finances. I mean right now starting my third season they are great, probably could have been better if I didn't spend £7.5m on upgrading the youth and training facilities but that is something that I always do in any save so it doesn't really bother me. My main problem is giving the quality players that I want the wages they want. As you will see coming up probably in my preseason update I bought Kevin Gameiro from PSG for £3.5m but he is getting £60k per week wages which kind of upsets me because he will be my highest earner at the club and I fear bringing in more of these high wages will make our finances start to dwindle if we don't advance farther in the Champions League. I guess I might have to take a chance in bringing in quality players on higher wages to hopefully make us advance farther in the Champions League but I always like running a tight budget and I still have not used the 48 month installments. Here is a picture of my clubs current finances in June 2014 and you can see how they compare to yours. I think it is safe to say we should not be entering at the 2nd qualifying round of the Champions League... This was the first leg as well. Well let's start with the players leaving the club. Only two players that were sold of significant value and one I really didn't want to sell but for £10m I couldn't say no to selling Grant Hanley to Southampton. Nigel Reo-Coker left because his contract was coming to an end at the end of the season upcoming and he wanted £50k per week wages which I said no to. I spent a good amount this summer but I feel I added some quality players. Kevin Gameiro joins for £3.5m which I believe is a big bargain and I hope he can bang the goals in for us. 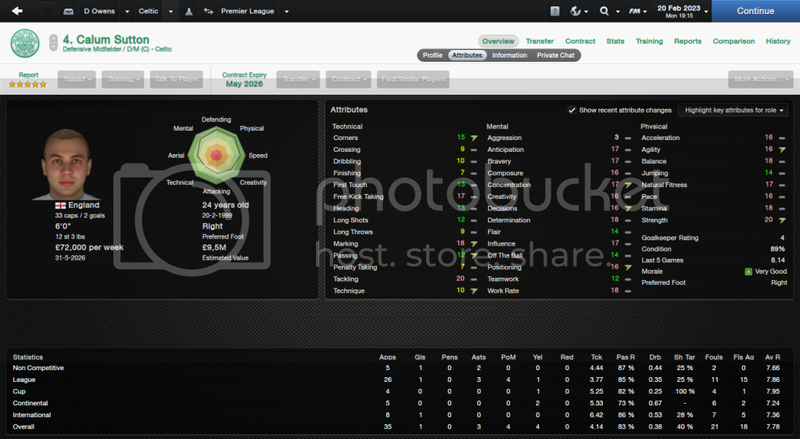 I also brought in Ibrahim Afellay from Barcelona for just £4.4m which I believe is another steal. I had to break my wage structure for them as Gameiro is on £60k and Afellay is on £49k I believe. I brought in Stefan Bell and Andreu Fontas as replacements for Grant Hanley. 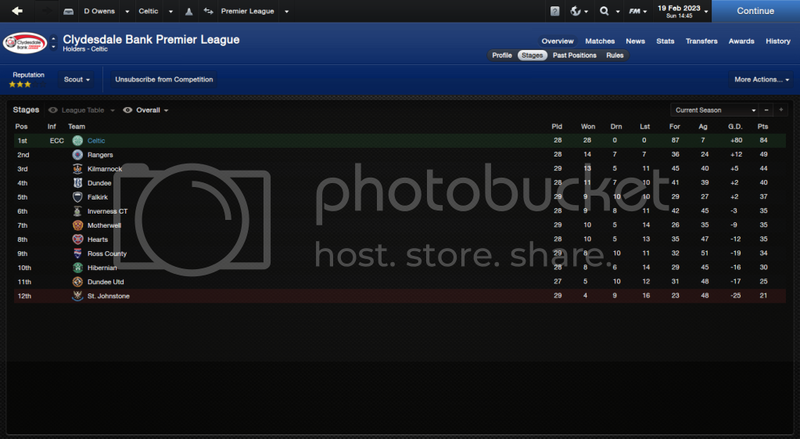 Here is my Champions League group this season. We have Manchester United, Schalke and Dynamo Kiev. I believe we could possibly get 2nd but I wouldn't be upset with 3rd again. Well we dominated the league this season. We failed miserably once again in the Champions League though and our finances have taken a horrible turn for the worse. We are slowly going into debt and I have a feeling I might try and off load some of my high earners (Gameiro, Afellay, Ledley, Brown, Wanyama). I hope we can make advances in the Champions League but it seems to be proving very difficult. Jesus bloody forgot about this thread guys sorry lol So am in season 2017/2018 and wow my game is rocking. 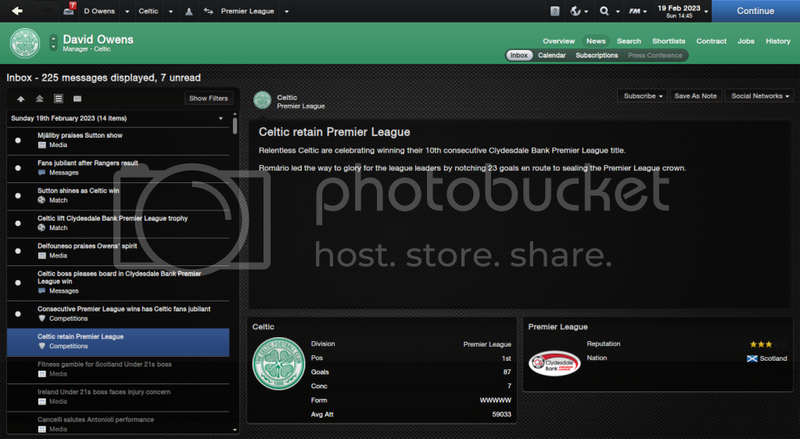 Have won the SPL 5 seasons in a row and loads of scottish and league cups. 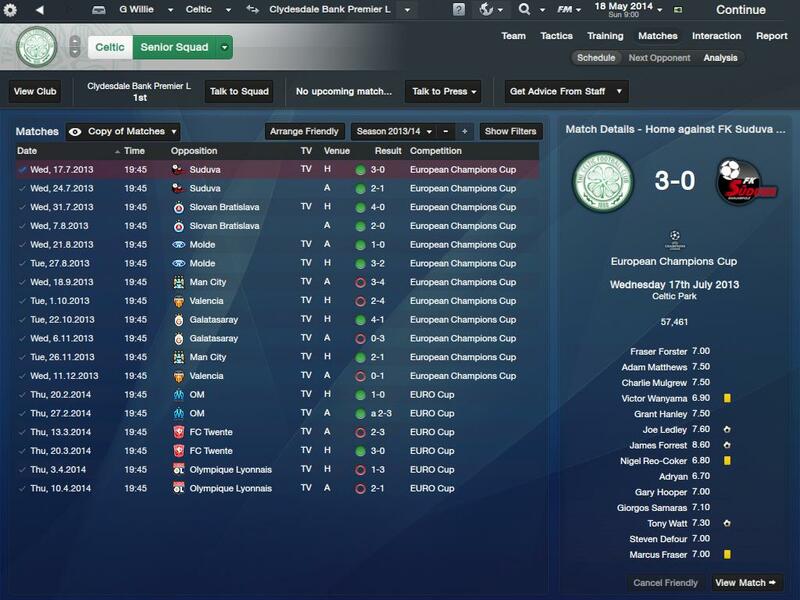 Add to that i won the Champions League 2 seasons ago beating man utd 2-1 in a cracking run. Made the semis of the Europa League last season being destroyed by Man City. Teams looking good will post some screenshots and a better update later when get some decent screenshots. Why is Efe Ambrose rated so poorly. He looks an excellent prospect with a lot to offer but looks shabby in this game. Surerly he deserves an update in the next upgrade? McGeogh has great potential but the game does not warrant this for some reason and needs to be re-looked at. Paul George and some other youth players have bags of potential but again are overlooked and are far better than what the game puts them at. Apart from a few players most ratings are spot on for Celtic but some of the potentials are shabby. The youth champions league is a good way of knowing who has piotential or not so just wondering if the researcher has looked at these games where the youth team are up against some of the best yongsters in the world. Celtic's central defenders have been pretty poor for me that is why Victor Wanyama has played CB for all 4 seasons so far. I bought Andres Fontas and Stefan Bell and they are playing great. Really hope its true. Been pretty poor for the last few years especially the youngsters. My last season (2015/16) we went undefeated in the league winning 31 games and drawing 7. Haven't been playing the save lately but Levein has just resigned from Scotland manager so I hope I am able to get that job to find all the young regens. how will being Scotland boss help you to find the newgens? You are able to scout the entire U19 national squad. 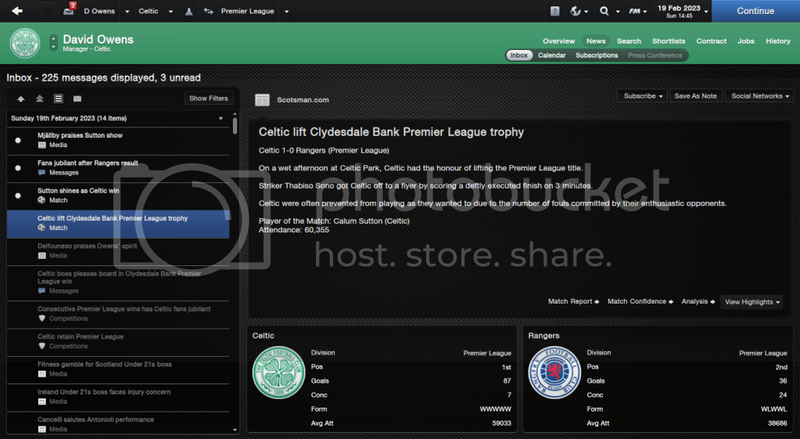 I have my chief scout at Celtic my assistant manager for Scotland. He's not just a good scout but a good coach as well. Isn't scouting Scotland, when the newgens comes into the game easier than to take the Scotland job as well? You shouldn't have sold Wanyama, he is a straight up beast even at CB where I play him and I'd rather be able to have my scouting updates automatic due to being the manager than having to do a manual scouting report and then having those players in my shortlist for a year because there are so many. Have brought through a lot of scottish youth. Average age of my first team squad is 23. Plenty of scots involved at first team level. Craig Levein just left the Scotland job. I applied and they laughed off the application. They then appoint Steve Clarke. My reputation is World Class. I have turned down job offers from Man Utd and Inter. 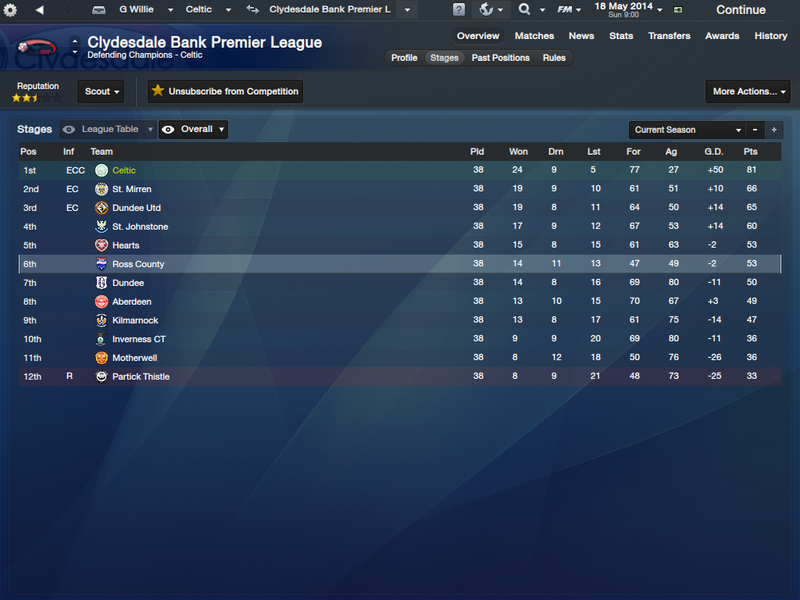 I should at least be in the running for the Scotland job surely!! I would say they would at least be respectful though. For them to laugh off my interest just doesnt make sense.